Graduated with degree in Electrical Engineering from University of Detroit. Worked 20 years in the semiconductor industry, including 14 years at Intel Corporation. Taught part-time in the Electrical Engineering Master’s Degree program at Sacramento State. Have taught full-time in Sierra Mechatronics program since 2006 and founded the Robotics club in 2007. 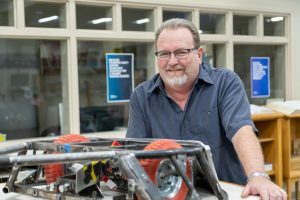 Summer of 2017 was a competitor on the ABC television show “Battlebots” as part of team Stinger.